A recording sheet is included. 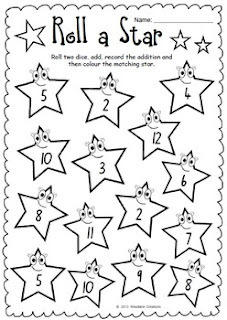 Colouring the stars adds more fun to the exercise. The Maths activities in this packet support the development of the following concepts: addition and subtraction within 20; addition strategy of counting on; the meaning of the plus, minus and equal signs; commutative property of addition (3+5=5+3). This activity could be played in a pair or small group. Each player has their own worksheet. Taking turns, if a roll doesn't match any remaining numerals, move on to the next player's turn. The first person to colour all their stars is the winner. This is the British English version ... there is also a U.S. version listed.